This sample explains about the creating the RESTful service to create and updating the resource information available at the sever side. This Restful service will be consumed using client console application. Step 1: For our example we are suing “EmployeeData” class as Data Access Layer for storing and reading the employee information. Step 2: Let’s start create EmployeeService (simple WCF) with ServiceContract, OperationContract and DataContract as shown below. Step2: This service can be hosted as normal WCF service by creating the ServiceHost object and adding endpoint with different binding. This is already explained in “ConsoledHosted WCF Service”. Step 6: Now we have completed with service implementation project. Let’s start with Hosting the RESTful service. For this example we are using console application for hosting service. WCF framework has provided new class to host the RESTful service i.e WebServiceHost. By hosting the restful service with WebServiceHost host class will automatically set the binding and other configuration setting. In the below code you can see that I have only mention url for the hosting. 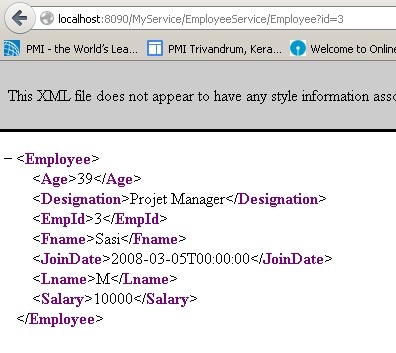 If we need to get specific employee details, pass the employee as query parameter as we mention in UriTemplate of the service. Step 8:Now we can start with client application. For this example we can create a console application to read the employee information and add new employee to the server resource. 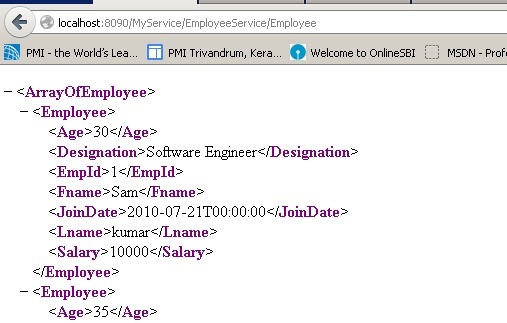 Below code first read the employee details from the server and add new employee and once again it read the employee details to confirm the added resource.